Sorry, back to buttony dresses after a brief diversion! This was actually the very first one I made, which kickstarted my little obsession. 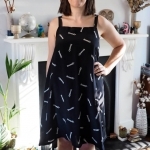 You have the lovely Amy of Almond Rock to blame, because we did a Sew Bossy swap and this dress is the result of my lovely swap package. We decided to do Sew Bossy together because we have pretty similar taste in fabrics and projects. And yup, safe to say I pretty much love this dress. 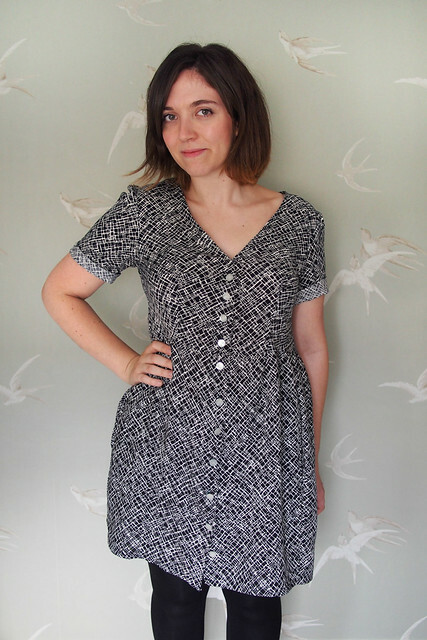 Amy picked me the Darling Ranges pattern, some monochrome slinky viscose and some pretty pearl buttons. As I mentioned, the fit of the Darling Ranges was pretty great on me out of the packet. I cut the size S which matched my upper measurements – hips too big like normal but the gathered skirt is forgiving – grading to XS at the shoulder. 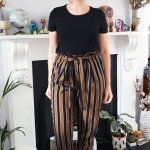 I made a couple of my normal adjustments – raising the waist, shortening the skirt – but I’m very impressed with the fit out of the packet otherwise. It’s kind of loose-fitting but doesn’t look oversized, since the shoulders and bust fit well. I left off the optional cinching waist ties since I like how it looks as it is. 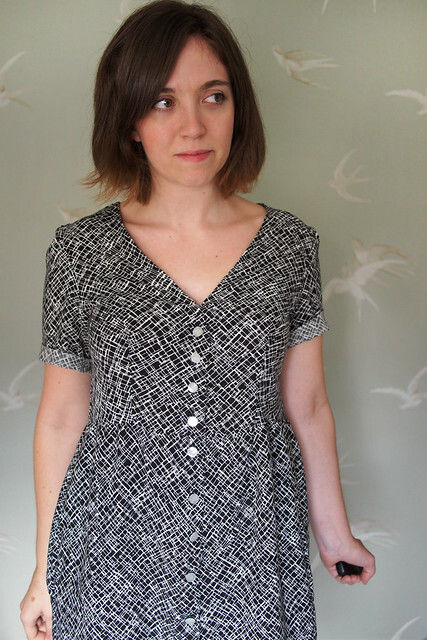 I’m definitely more of a round than v-neck person but decided to sew the pattern up as written in the spirit of Sew Bossy. It’s a little bit lower than what I’d usually go for, but it doesn’t gape at all. I’ve tacked it closed just above the top button. I’m not usually an in-seam pocket fan as I think they add hip bulk and make skirts hang funny, but went ahead and added them here. I can’t keep my phone in them without distorting the skirt, so maintain they’re useless except for awkward hands. Umm, and looking at these photos I’m going to check the sleeves are the same length because they look way off here (I just rolled and tacked them down). 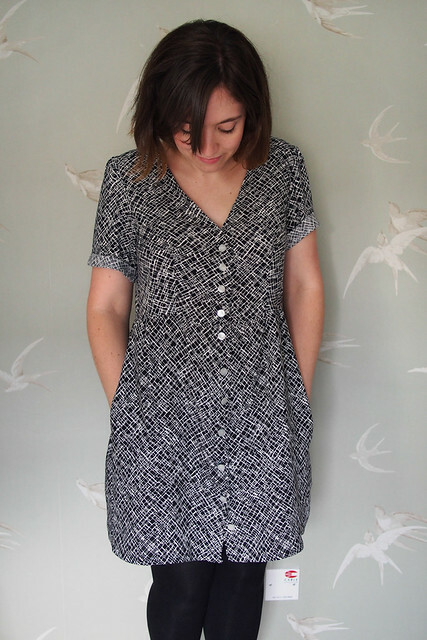 I feel quite chic in this dress – it’s rather Whistles, no? And it gained my first ‘I love your dress, where did you get it?’ compliment from someone who doesn’t know I sew: definitely a Bossy Win. I can see even more Darling Ranges in my future (I like the look of the dartless tunic variation) after a bit of a break for something different. Be sure to hop over to my swap partner in crime Amy’s blog and see what she made with the kit I sent her. this fabric is so perfect for the darling ranges, i really love it! I love this look on you – “classic Katie”! Great fabric, your bossy buddy has lovely taste in fabric. this is lovely! 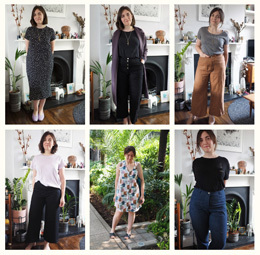 i love the sew bossy, it’s always fun to see how bloggers interpret each others styles. i think you and amy did a great job at it! That looks lovely on you, I think the v neck really works well with the pattern and the fabric. I love the fabric and I’m straight off the Amy’s blog to ask her where she got it! I love this dress! So perfect for all occasions really. I need to get on the Darling Ranges train!! It really is, will layer beautifully for autumn too. Oh, this is gorgeous! 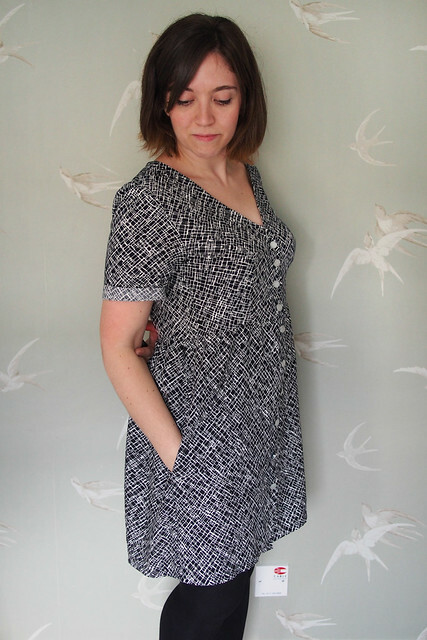 I do like the Darling Ranges pattern, and your fabric is lovely. It’s a great little pattern! I’m not much of a v-neck person either, but this looks so lovely on you. All your button down dresses are getting me scheming to make some of my own, especially with sleeves. So much better for cooler weather. This is so you! What a great dress!